Free Mom | A Savings WOW! Are you looking for something fun to do for Mother’s day that includes a meal AND entertainment? You’re in luck! 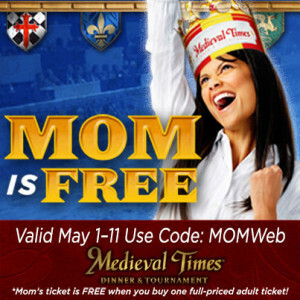 From now through May 11th, Mom’s ticket is FREE when you buy one full-priced adult ticket at Medieval Times. Be sure to use the code MOMWeb at checkout to receive this discount. Let your family cheer on their favorite knights!